When you bring your cat in for a check-up, your veterinarian likely talks to you about vaccines and gives your kitty a good look over. They may draw blood, or recommend preventative care routines, like a dental cleaning or grooming. But what are some of the most common serious ailments for cats that your veterinarian wants to help you prevent and control? 10. Kidney disease: Kidney disease is common in senior cats, but also seen in cats of all ages. It can be congenital or develop as the pet ages. While cats with kidney disease can be treated and kept healthy for several years in most cases, dogs typically deteriorate more quickly. Kidney health is typically evaluated with annual bloodwork at your veterinarian. 9. Diabetes: Just like with humans, cats can develop diabetes as part of the aging process or improper diet. While diabetes in cats and dogs can often be controlled by a plan of diet and exercise, some pets will require regular insulin shots. 8. 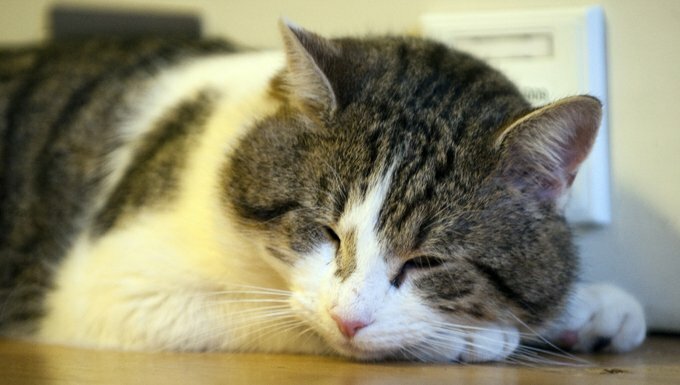 Arthritis: Arthritis is often seen as a rite of passage for our older cats. They may seem slow to rise in the morning, or a bit reluctant to jump up to their favorite spot on the couch. Your veterinarian can diagnose most forms of arthritis during a routine exam, but they may also recommend an x-ray to rule out other issues or evaluate how seriously inflamed the joints are. While there is no cure for arthritis, there are joint supplements, and even treatments like acupuncture, to help keep your cat as mobile as possible for as long as possible. 7. Rabies: Rabies is the disease made famous in the hearbreaking scene in Old Yeller. Thankfully, the widespread use of the rabies vaccine has made its occurrence in pets in the U.S. quite rare. However, it is still present in wild animal populations, and because rabies is always fatal, it’s critical to make sure that your cats are current on their rabies vaccination. 6. Feline Distemper or panleukopenia: Feline distemper is a tragic, often fatal disease of cats and kittens. The virus typically comes along with neurological symptoms, nasal discharge, and high fevers. 5. Parvovirus: Commonly called “parvo,” this virus is terribly common in parts of the country with low vaccination rates and can be seen in cats and dogs (although the disease cannot be spread cross-species). Parvo is most frequently seen in puppies and kittens who have not yet been vaccinated. The mortality rate depends on how quickly the symptoms are caught by the owner and addressed by a veterinarian and the strength of a pet’s immune system. Most survivors of parvovirus do not harbor long-term effects. 4. Dental disease: Just like humans, cats can develop tartar, gum disease, and cavities that require a professional dental cleaning. Dental disease is the perfect example of “an ounce of prevention is worth a pound of cure,” because bad oral health can also lead to dangerous heart and kidney conditions in cats. Teach your kitten that brushing their teeth is a normal part of your grooming routine and save your cat a dental procedure down the line. 3. Heartworm: Heartworm is a disease spread by mosquitoes and it has been diagnosed in all 50 states. While it is much more common in dogs, cats can also acquire the disease. If the infection is caught early enough, it can generally be treated, but there is no cure for feline heartworm disease. Therefore, the best way to keep your pets heart free of potentially deadly worms, is through a monthly preventative, prescribed by your veterinarian. 2. Obesity: Obesity has become as serious of a problem in our cats as it is in the human population. Sadly, overweight pets are more prone to heart disease, diabetes, arthritis, cancer and premature death. But while underlying disease or slow metabolism might be a factor, all too often, pet obesity is caused by doting pet parents who overfeed and underexercise their cats. There is no quick fix for obesity, but, just like with a human diet, check with your veterinarian for feeding and exercise guidelines. It might sound crazy, but when it comes to obesity, we can love our pets to death. You can help your cat live a long life by giving them the tools to stay light on their paws. 1. Cancer: Cancer use to be rare in our pets but as of 2017 it’s an epidemic. It’s the leading cause of death for pets in their senior years. Nobody knows the exact cause of cancer but outside factors like toxins in the environment seem to play a big role. Treatments include chemotherapy and radiation but also other holistic and alternative medical treatments are available. There is no cure for cancer and treatments all too often fail.